My friend, Maria, said to me the other day: "why haven't you put up the review for Dabbous yet?" "Well, I am letting some time pass by, I said, for my greek-ness to fade away, so I don't come across too strong." "No, that's exactly how you should write", she said. 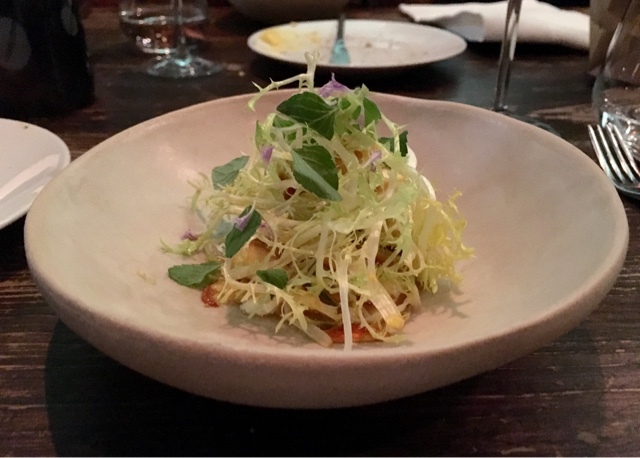 Charlotte Street is always a fun place to go to, especially if you are on the lookout for diverse dining experiences. Dabbous is hidden behind tall, heavy doors, just around the corner in Whitfield Street. I got there just after 7 on a week-night and upstairs, at the restaurant, there was only a couple dinning. I went downstairs to Oscar's Bar, thinking "that's where everyone is going to be". Not exactly. 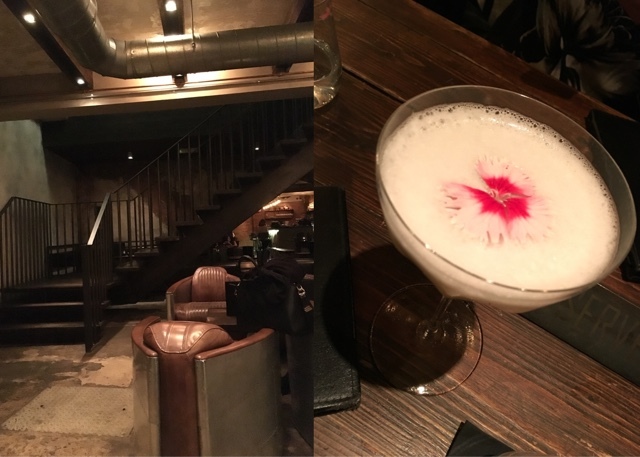 There were a couple of people, quietly sipping away on heir cocktails. Raw, industrial look, I like it, but without many people around, it did look a bit cold. The thought did come to mind: "Where are all these people that have to wait for 6 months for a reservation, to eat here?" Cocktails were good; strong, but good. The Hemingway Daquiry packed a punch and came with a cherry that was appropriately soaked in alcohol in the end, delicious! We had to send the Sean Honeycombs back though, because just a tiny dab on the lips would knock your socks off. They were kind enough to take it off our bill. By 8ish the restaurant, upstairs, was full. I figured it out: they must only have one seating! That's why people have to wait so long to get a table here. 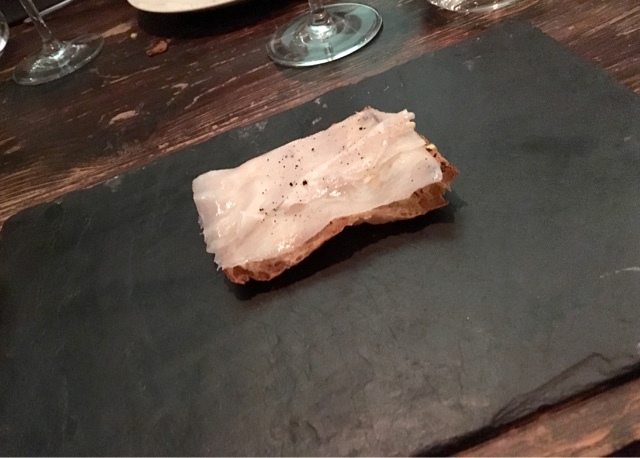 We had the tasting menu at £68. Here's the thing: the whole table has to go for the same menu. 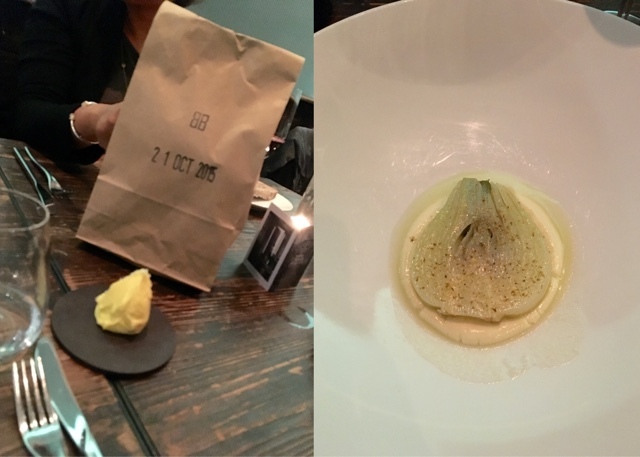 Well, you get two choices anyway: the Set menu at £56 and the Tasting Menu at £68. No à la carte option, unfortunately. The bread, was one of the best features on the menu: warm, soft and nutty. It came in a brown bag with the day's date stamped on it - and the butter was soft and salted, good start. First: fenugreek. No, that's it! A lovely, perfectly shaped slice of fenugreek's heart, poached. Second: Lard. On toast. Discuss. Third: Cornish squid with lettuce & clove. That was interesting, although opinions around the table really differed. 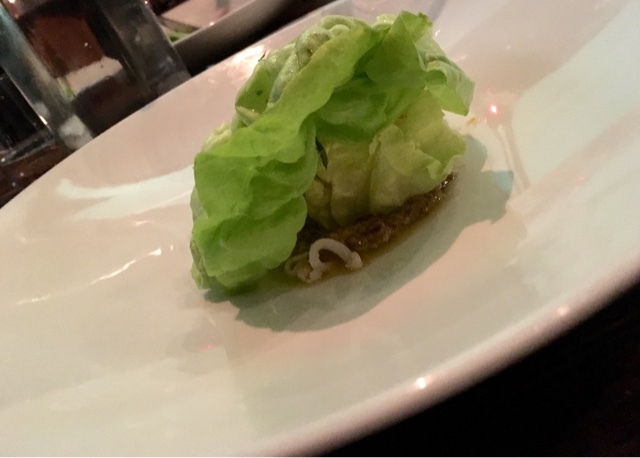 Some called it "innovative", some said they weren't sure; it was a bit heavy on the sesame oil, for me and although the lettuce leaf on top felt a bit sloppy for presentation, it did help keep the overall flavour clean and fresh. One bite, second bite...next! 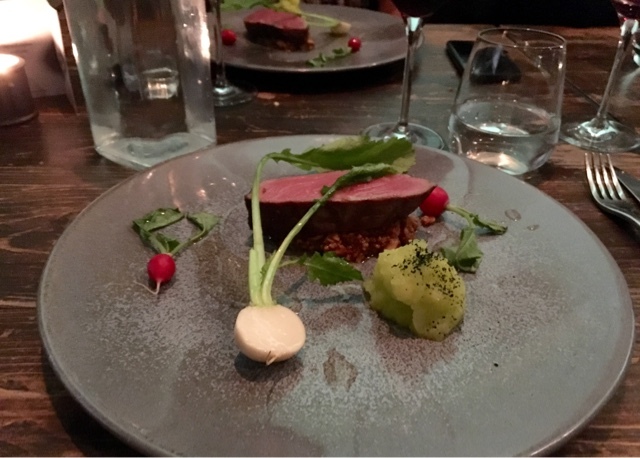 The main was the best dish out of them all: Barbecued Iberico pork with acorn praline & crushed green apple. The green apple could have easily been missed, but the smoky pork with the crunchy salted praline was brilliant. We all agreed that we could have easily had a second piece of the pork, without being too full. Dessert: warm milk pie with poached fig leaves - it was light and rounded up the meal nicely, but I didn't get the hint of figs-leaves, but rather a coconutty flavour. The chef who put this together is talented, there is no doubt about that; some very unusual ingredients like lard or acorns certainly surprise you. The place is interesting, with a hint of New York industrial raw look, but only looks its best when it's full of people. But for roughly £100 per head, most of us felt a bit let down. Value for money is what let us down. I'm saying "us" because opinions around the table agreed on this point, so no, it's not just me being grumpy in my old age. I honestly thought that in the last couple of years, there had been a turn away from these "designer portion" dishes, hence maybe I was caught off guard. For a chef, to put his name above the restaurant door is a dream and the effort that goes into it must be respected, hence there is certainly room for revision, rather than improvement, here.